Tonight was so much fun!!! And now THIS is what my new trainers look like…! I parked up at Tescos and ran the mile to the country park where Kev had said he would meet any trail runners that fancied heading out tonight. There ended up being four of us. Kev, who is in Group 4 with me, another Kev from Group 3 and Andy from Group 5. It was actually quite reassuring having a member of Group 5 there as I didn’t have to worry about being too slow for everybody. We ran up and back down almost vertical hills, ducked under branches, leapt through muddy bogs and slipped across a mini waterfall. We shrieked as our feet ran away from our bodies when they gathered speed heading down the steep hills and laughed when Andy lost his trainers in a thick section of mud. 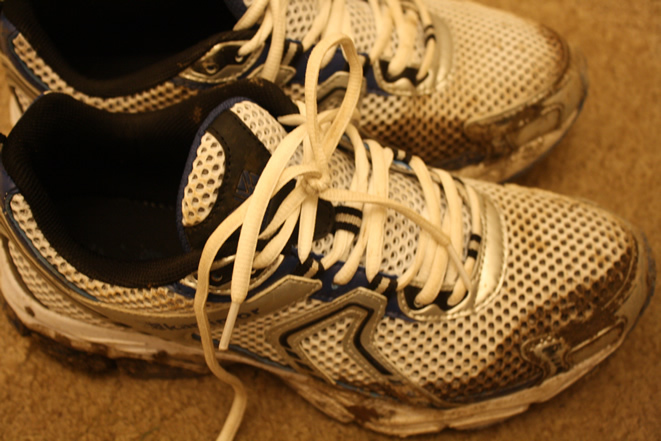 And then tried not to laugh when Andy slipped and fell right into the mud. We only covered about five miles and our pace ranged from 7mm to 14mm as we navigated our way around tracks I had never noticed before. Kev kept giving me tips and pointers for my upcoming Ultra at the start of June and commented that my uphill running was very strong, which I already knew but was nice to have somebody else notice it! It’s downhill running that I struggle with. The trusting of my feet not get carried away and disappear with me! With uphill running I can focus all my energy into going forward and drive with my arms. This has always been one of my strengths with road running. I didn’t take any pictures, but wish I had and might head over there this weekend to get some shots of just how steep the hills we were running up were! 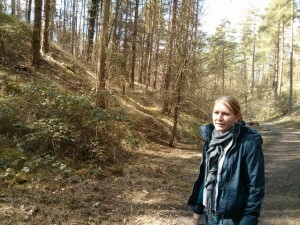 Below is a picture Dan took of me when we went walking in the park during the Easter holidays. Basically that steep trail to the left of me (not the main track I’m stood on, but the slightly worn path heading diagonally up from me to the top left hand corner of the picture) is nothing! We ran down tracks like this all night and then used the forward going momentum to help take us back up the other side again. 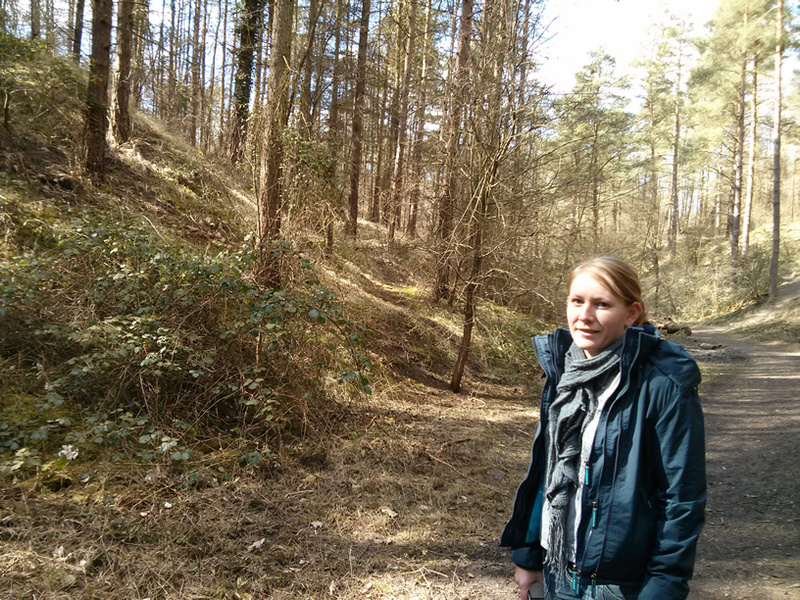 The really steep ones though we were power walking up and using trees to help pull us up the paths. I NEED to get pictures because no words can truly describe the drops we went over tonight! Dan had already had dinner by the time I got home so I grabbed the best sandwich I know of! 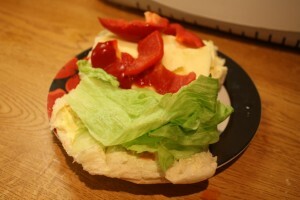 A cheese salad sandwich. I used to live on these in my first year of high school. I so easily could have turned around and made myself another one as soon as I finished this! It was made of cheese, lettuce and half a red pepper. YUM! There’s a strong possibility this is featuring at lunch tomorrow! At about 9:55pm I panicked, convinced I was going to die of starvation overnight as I can’t eat after 10pm this evening before my blood tests in the morning. This will end up being about 11 hours without food. I usually get up between 5-5:30am so this is going to be pretty hard going for me. 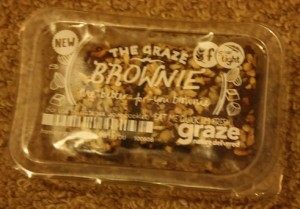 Dan convinced me to grab a Graze box so I went with the new Graze Brownie. 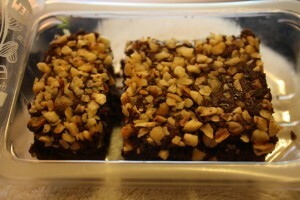 It’s tag line was ‘the better for you brownie‘. Hmmmm…anything that is originally a sweet delicious treat that you are told is ‘bad’ for you and then comes out as a ‘better for you’ version is usually pretty rubbish and tastes nothing like the original. I spun the box around before opening so that I could get a good look from all angles. Nothing unusual to report so I tore back the lid. Inside, the brownie was split into three, like Graze’s flapjacks (although I have never eaten just one third in a sitting). I smelt it. It smelt good. I lifted it to my lips and had a little nibble. Mmmm, nice and soft and gooey. Are you sure this is better for me Graze because the whole brownie disappeared pretty quickly and has been added to my ‘Send again soon’ list on your website! I definitely approved. LOVE trails… I use to runt hem all the time when I was living in WI but haven’t gotten as into it since moving to NC.